We start our journey from the Southern tip of Argentina in Ushuaia. From here, we set sail on our wildlife -rich journey towards the Falkland Islands. This archipelago of over 400 islands, is an important breeding ground for penguins, elephant seals and sea lions and we will have plenty of time to explore and admire its delightful offerings before sailing on to South Georgia. Often described as the gem of the Southern Ocean, the splendour of South Georgia is hard to describe - stunning snow-capped mountain landscapes, deep fjords, tousled tussock grasses and wild beaches, all combine to provide superb stunning photo opportunities. Here, you will find the most important colony of king penguins, fur seals and elephant seals and it is estimated that over 10 million sea birds visit the area each year. We crown our voyage on the beautiful western flanks of the Antarctic Peninsula, discovering incredible chinstrap, Adelie and gentoo penguin rookeries along the way. Zodiac-cruise among towering ice shapes and marvel at the solitude and purity of one of the last true wilderness areas on earth. Arrive in Ushuaia, where you will be transferred to your downtown hotel. The rest of the evening is at your leisure. This morning, your luggage will be collected from your hotel and transferred directly to the port for clearance and loading onto the ship. You will have the first part of the day to explore Ushuaia, before boarding commences at 4 p.m. After settling into your cabin there will be safety briefing held out on deck, as you sail out across the Beagle Channel, with spectacular views over Ushuaia and Tierra del Fuego. This evening, you will have time to get to know your friendly crew and fellow expeditioners at a welcome dinner, celebrating the start of a thrilling adventure to Antarctica and South Georgia. As we commence the Drake Passage crossing, we make the most of our time getting comfortable with the motions of the sea. The expedition team prepare you for your first landings, with important wildlife guidelines and they will also start their informative lecture program. You will learn more about Antarctica's history, wildlife and environment, preparing you for the days ahead. Our wildlife experiences begin as we enjoy watching and photographing the many seabirds, including majestic albatrosses and giant petrels following in our wake. Nearing the tip of the South Shetland Islands, the excitement is palpable with everyone converging on the bridge, keeping a look out for the first iceberg. The ocean takes on a whole new perspective once we are below the Antarctic Convergence, and we are surrounded by the surreal presence of floating ice sculptures. Weather permitting, we may attempt our first landing in Antarctica by late afternoon. Over the next three days, a host of choices are open to us and depending on ice and weather conditions, the western side of the Antarctic Peninsula is ours to explore. Our experienced expedition team, who have made countless journeys to this area, will use their expertise to design our voyage from day to day. This allows us to make the best use of the prevailing weather, ice conditions and wildlife opportunities. An abundance of wildlife can be found on the Antarctic Peninsula - from whales to rookeries, birdlife to seals - there will be plenty to take in over the next few days whilst we explore this frozen land. The scenery is simply breathtaking and we will have plenty of time on shore and in Zodiacs, to soak up our surroundings. Because we are so far south, we will experience approximately 18-20 hours of daylight and the days can be as busy as you wish. We will generally make landings or Zodiac excursions two and occasionally three times a day, where we will enjoy; cruising along spectacular ice cliffs, following whales that are feeding near the surface, landing on the continent and its off-shore islands to visit penguin rookeries, seal haul outs, historic huts, and a few of our other favourite spots along the peninsula. There will be plenty of time for sleep when you get home! A final day to enjoy the serenity of Antarctica, before heading towards South Georgia. Today, if weather permits, we set course for Elephant Island, a half-submerged mountain cloaked with an ice sheet at the outer limits of the South Shetlands. We'll learn the story of Shackleton and hear how his ship, the Endurance, was crushed in pack ice in the Weddell Sea, before him and his men climbed into three open boats, spending 16 months at sea, before finally making landfall on this tiny toe of rock and ice in the vastness of the Southern Ocean on 14 April 1916. We plan to sail past Cape Valentine to see the beach where the men first put ashore over 100 years ago. Weather permitting; we hope to follow the coastline six miles west to Point Wild, where the men eventually set up camp under two of their upturned open boats and some old tents. If weather permits, we'll attempt to make a landing on historic Point Wild, Elephant Island. En route to South Georgia, we'll head across the Scotia Sea, following the route that Shackleton and five of his men took in order to find help for the rest of their crew. On 24 April 1916, they piled into the James Caird, the most seaworthy of their open boats, to attempt this perilous journey to South Georgia, some 1290 km in distance. 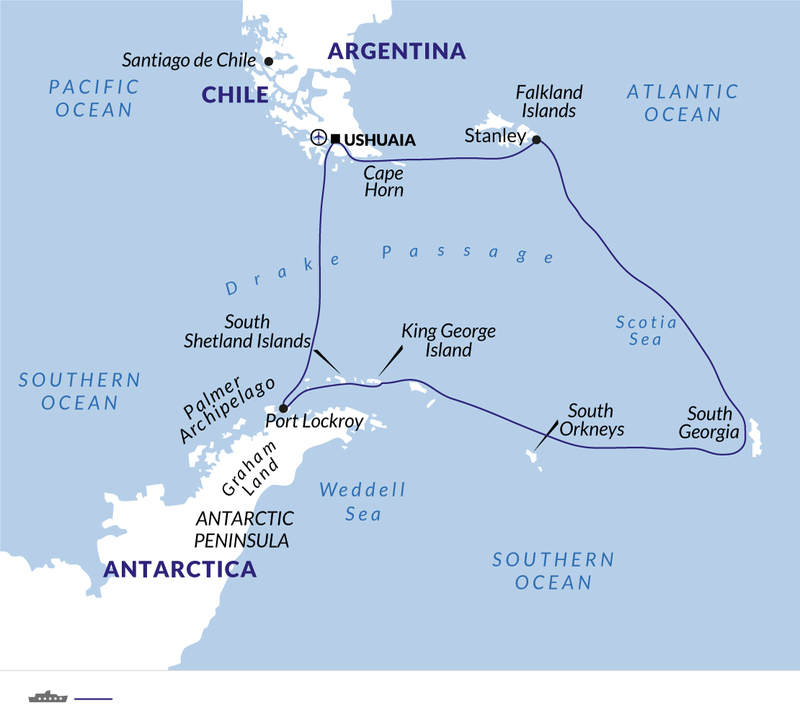 Shackleton hoped to reach South Georgia in two weeks. There he would enlist the help of the whalers to return to Elephant Island and rescue the men who had been left behind. As excitement builds for South Georgia, catch up with fellow expeditioners in the bar, keep watch for wildlife alongside our naturalist from the open bridge, or learn more of the Shackleton story from our historian. South Georgia is one of the world's most amazing natural environments. Just a speck in the vastness of the South Atlantic Ocean, and lying wholly within the Antarctic Convergence, South Georgia and the South Sandwich Islands are a life-sustaining haven to some of the World's largest congregations of wildlife. The surrounding sea is one of the most productive areas on Earth and supports the life of millions of seals, whales, penguins and other seabirds. Over the next few days you'll explore the wildlife oasis of South Georgia. Witness one of the World's largest king penguin rookeries, spot the wandering albatross and step back in time, as your on-board historian retraces Ernest Shackleton's route from Fortuna Bay to Stromness. You'll enjoy some free time to roam secluded beaches, alive with basking elephant seals and you'll have the chance to cruise by Zodiac alongside penguins and playful fur seals. We have ample time to explore South Georgia's spectacular northern coast, penguin rookeries and majestic albatross nests. A 3,000-metre mountain range forms the spine of this long, narrow island. Between the mountains, shattered glaciers carve their way through tussock grass to the deeply indented coastline - a landscape that is synonymous with the epic expedition of survival by Shackleton, Worsley, and Crean. Abandoned rusting whaling stations and remnants of explorers reflect a time of long ago, while summer workers conduct scientific and regeneration projects. Kelp-strewn beaches are cluttered with basking elephant seals, feisty fur seals and penguins. We will explore the king Penguin rookeries that this area is renowned for, where hundreds and hundreds of penguins dot the landscape. Lose yourself amongst these gracious-looking creatures and ensure cameras are fully charged for this incredible wildlife spectacle - an absolute highlight of South Georgia. You will also have the opportunity to visit the fascinating whaling museum at Grytviken, as well as pay your respects to Sir Shackleton, at his nearby grave. Originally a Norwegian sealing and whaling station, Grytviken was finally closed in 1965. Now it is the administrative centre and a hub of activity in South Georgia. The former whaling station stands as a solemn testament to the whaling days, but the museum offers much more than a whaling past. It has many of the local animals on display, as well as the island's history of exploration. As we wander around the site, skirting the ruins of factory buildings and peering into the past, we must be careful to avoid sleeping elephant seals or disturbing small groups of king penguins, as we imagine what it was like when whale processing was in full swing. Abandoned ships lie sunken alongside hundred-year-old wharfs, while pitted concrete walls remind us of the more recent Falkland's War which started here. Between South Georgia and the Falkland Islands (Malvinas), you will be entranced by the ceaseless flight of the many seabirds that follow our wake, skilfully using the air currents created by the ship to gain momentum. On this leg, we are usually travelling into the prevailing weather so it is difficult to estimate our arrival time in the Falkland Islands. Our lecture program will continue and highlight all of the amazing sights we have witnessed over the past few days. We'll have ample time to enjoy the rest of our time observing the seabirds, whale watching from the bridge, or simply relaxing in the bar with a book. We continue to cross the Scotia Sea and edge closer to the Falkland Islands. Located 477 kilometres east of southern Argentina, the Falkland Islands are a unique mix of wildlife hotspot and inhabited outpost. An archipelago of over 700 islands but consisting of two main islands, East and West, only seven of the islands are inhabited. The cold, nutrient-rich waters surrounding the islands makes them a prime location for marine life, including seabirds and seals. Our time in the Falkland Islands includes a short walk from Stanley town. You may choose to spend the sea days returning to Ushuaia editing your photos, enjoying the onboard facilities or listening to an informative lecture. During the early morning, we cruise up the Beagle Channel, before quietly slipping into dock in Ushuaia, where we will be free to disembark around 8.00 am. Bid farewell to your expedition team and fellow passengers, before you continue on with your onward journey. A transfer is included to either downtown Ushuaia or to the airport, depending on your onward arrangements. Information A transfer is provided from the pier to downtown Ushuaia or to the airport, for onward travel.